Hg Capital offers a wide range of investment programs. Given the changing global economic climate, it is important not only to diversify within strategies, but also to diversify among strategies. We offer diversified investment solutions that span the universe from capital preservation to aggressive growth—from conservative asset allocation to actively managed risk-capital opportunities. 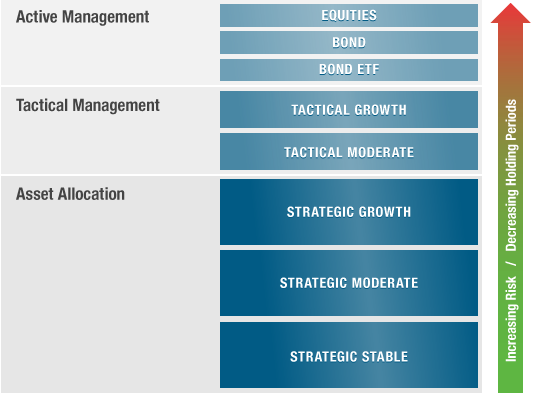 This diagram represents the range of the investment solutions offered by Hg Capital. Those at the base are designed to be more stable, with lower volatility and longer holding periods. Those at the top have greater upside potential, are higher risk and have shorter holding periods. When properly mixed these programs are designed to provide a new level of diversification—across methodology, holding timeframe and asset class—beyond traditional investment philosophy. This enables you to build portfolios your clients can stay with, meeting their investment objectives and comfort levels in all market environments.